Asia News reports that everything suggests that the American bonds seized at Chiasso are real. Milan (AsiaNews) — Four weeks have passed since American bonds were confiscated from two Japanese men who were travelling on a direct train to Chiasso, Switzerland, and while there has been clarification of some - very few -points, Italian authorities have remained silent on the rest of the episode. The major English-speaking newspapers ignored the story for a couple of weeks. They only started to report on it after the Bloomberg agency carried a story on 18 / 6, in which a spokesman for the Treasury, Meyerhardt, declared that the bonds, based on photos available on the Internet, were "clearly false." The same day, the Financial Times (FT) published an article whose title laid the blame for the (alleged) infringement at the feet of the Italian Mafia, despite the fact that the article failed to make even one possible connection with the episode in Chiasso. Nevertheless, the version of events as reported in FT was taken up by others as being "appropriate" (given that it is a very common clich� about Italy and it is a sequester that took place in Italy) and in the end "colourful." It's a pity that it goes against all logic: that the Mafia tried to pass unnoticed in its attempt to dump fake bonds amounting to 134.5 billion dollars and moreover were to "stung" a mere step from their gaol, is not very credible. Most recently last week, 25 / 6, the New York Times reported on the story in particular, the allegations of CIA spokesman, Darrin Blackford: the U.S. Secret Service carried out inspections, as required by the Italian judiciary, and found that they were fictitious financial instruments, never issued by the "U.S. government". It is not clear, however, how the checks mentioned by Blackford were carried out and whether they were also are carried out via internet. In fact according to official Italian sources the Commission of American experts, expected in Italy, have yet to arrive. Furthermore, the bonds were accompanied by a recent and original bank record. It is therefore unclear how the U.S. authorities can declare fake documentation that does not originate from the Fed or the U.S. Department of Treasury. On the contrary, claims in support of the bond's authenticity were made 20 / 6 on the Turner Radio Network (TRN), an independent radio station broadcast via Internet. On that date in a massive exposure, TRN stated that the two Japanese men arrested by the Guardia di Finanza (GdF) and then released in Ponte Chiasso were employees of the Japanese Ministry for Treasury. AsiaNews had also received similar reports: one of the two Japanese arrested in Chiasso and then released is Tuneo Yamauchi, is the brother of Toshiro Muto, until recently vice governor of the Bank of Japan. On its website, the creator and presenter of the Radio, Hal Turner, had also claimed that his sources had revealed that the Italian authorities believe the evidence to be authentic and that the two Japanese officials are from the Japanese Ministry for Finance. They were supposed to bring the bonds to Switzerland because the Japanese government had apparently lost confidence in U.S. ability to repay its debt. Japanese financial authorities therefore were trying to sell a part of the securities in their possession through parallel channels ahead of an imminent financial disaster, thanks to the anonymity which, Turner said, is guaranteed by the laws of Switzerland. AsiaNews does not know to what extent Turner's revelations can be held as credible [neither do I], given that in this case too, it is difficult to believe that $ 134.5 billion would pass unnoticed anywhere in the world [It is possible if it was done through a Swiss "free ports"]. It seems far more logical to assume that the bonds, if authentic, were directed to the Bank for International Settlements in Basel, BIS, the central bank of central banks ahead of the issuance of securities in a new supranational currency [Had not considered this possibility]. Turner had in any event added that as evidence to support his revelations he would have provided the serial numbers of the seized bonds. Before he could do so, however, was imprisoned [Strange coincidence]. Hal Turner is the journalist who long ago first broke the news of a secret plan to replace the dollar, after a severe financial crisis, with a common North American currency, the Amero. In a dramatic phone call from inside the prison in which he is detained pending trial, relayed via internet, Hal Turner claims that his arrest is political and it is in relation to the securities seized in Chiasso, because the authorities are terrified by his revelations of the bonds' authenticity [IF the bonds's are authentic, then this is very logical]. Of course, the allegations made against him have to nothing to do with the story and thus an already intricate story becomes ever more complex. Turner maintains that he did not personally formulate the disclosure for which he has been imprisoned. Although it was clearly his responsibility to remain vigilant, it is also true that blogs from around the world and the U.S. themselves are full of threats and provocations. The coincidental timing, the unusual diligence and the details of his arrest arouse suspicions about the true motives of the American federal police. Indeed, this very arrest suggests that the evidence seized from GdF are truly authentic. One more element in favour of the bond's authenticity is found in the securities, which in the June 4 statement, the GdF termed "Kennedy Bonds" with photos provided. These photos reveal that the securities under discussion are not bonds but Treasury Notes, because they are securities that can be immediately exchanged for their worth in goods or services and because they are devoid of interest coupons. One side carries a reproduction of the image of the American president, the reverse side that of a spaceship. From confidential, usually well-informed sources, AsiaNews has learned that this type of paper money was issued less than ten years ago (in 1998), although it is difficult to know whether those seized in Chiasso are authentic. But the fact that the release of this particular State Treasury was not completely in the public domain tends to exclude the possibility of counterfeiting. It highly unreasonable to suppose that a forger would reproduce a State Treasury not commonly in circulation and of which there is no public knowledge. For this reason, it can be concluded that the 124.5 billion dollars divided in 249 bonds of 500 million each are authentic. These titles, although referred to as "Federal Reserve Notes" are actually bonds, because they accrue interest and are redeemable at maturity. But one question remains unsolved regarding them. It is somewhat hard to understand why the securities, which were from the outset indistinguishable from the original to the GdF, all have their coupons. Any ordinary investor, even a state, would have cashed in the interest coupon every year, so as not to lose purchasing power. My reaction: It looks like the bonds seized in Chiasso might be real. 2) Major English-speaking newspapers ignored the story for a couple of weeks. 3) According to official Italian sources the Commission of American experts, expected in Italy, have yet to arrive. 4) The bonds were accompanied by a recent and original bank record. 5) Turner Radio Network stated that the two Japanese men arrested by the Guardia di Finanza (GdF) and then released in Ponte Chiasso were employees of the Japanese Ministry for Treasury. 6) AsiaNews received similar reports: one of the two Japanese arrested in Chiasso is Tuneo Yamauchi, is the brother of Toshiro Muto, until recently vice governor of the Bank of Japan. 7) The Italian authorities believe the evidence to be authentic and that the two Japanese officials are from the Japanese Ministry for Finance. 9) Hal Turner, the creator and presenter of the TRN, claimed he would have provided the serial numbers of the seized bonds as evidence to support his revelations. 10) Before he could do so, however, was imprisoned. 11) The coincidental timing, the unusual diligence and the details of his arrest arouse suspicions about the true motives of the American federal police. Indeed, this very arrest suggests that the evidence seized from GdF are truly authentic. 12) Photos reveal that the securities under discussion are not bonds but Treasury Notes and that this type of Treasury Notes was, in fact, issued less than ten years ago (in 1998). 13) the release of this particular State Treasury was not completely in the public domain tends to exclude the possibility of counterfeiting. 14) It can be concluded that the 124.5 billion dollars divided in 249 bonds of 500 million each are authentic. 15) It is somewhat hard to understand why the securities all have their coupons. 1) IF one of the two Japanese arrested in Chiasso was really the brother of Toshiro Muto, until recently vice governor of the Bank of Japan, then he might have had the access to the real bonds necessary for forgery. B) Italian authorities reportedly believe the evidence to be authentic. C) The two Japanese arrested in Chiasso were apparently connected to the Japanese government. E) The type of Treasury Notes which were confiscated was, in fact, issued less than ten years ago (in 1998). 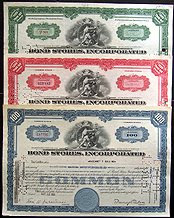 3) Even if fake, these bonds still represent a major problem, as I wrote in my last entry on the subject. Even if these bonds are counterfeit, they still present a major problem for the US. High-quality fraudulent treasury bonds measured in the hundreds of billions is the last thing the US needs to deal with right now, as it is already struggling to find lenders to finance the government's record deficit spending. These fake/real bonds also do nothing to inspire confidence in th e dollar at a time when investors around the world are worried about its worth. The Reason.com reports that the difference between 'they should die' and 'i'll kill you'. Mr. Turner also posted the judges' photographs, phone numbers, work addresses and courtroom numbers. This does not seem like a "true threat," one kind of speech the Supreme Court has said can be punished without violating the First Amendment. Turner did not actually threaten to commit violence; he simply argued that violence would be justified. What he said seems closer to incitement, except that in this case there is no threat of "imminent lawless action," one of the requirements imposed by the Court. Unless I'm missing something, what Turner said ought to be protected speech. On March 15, 2009, I wrote an entry titled *****AIG Pays Bonuses For Ruining The Economy*****. In that entry I quoted comments made in response to a MarketWatch article. Some of these comments were on the extreme side. Not one penny of bonus money should be paid to these AIG crooks. I dare any one of them to show their face at the bar of justice and declare to the American taxpayers they are owed these bonuses. Let me know the time, date, and location of the hearing. The one who had written / set-up and then signed these contracts should be put into jail. It is totally clear tunneling - nothing else. US and world-wide tax-payers sheep are going to pay it. Work more, pay more taxes, loans, interests, work more, more, more ... CHOOSEN ONES ARE LAUGHING. What an excellent modern slavery ages. Americans, take your legally owned guns and stop this madness !!! This needs to stop now. It's not funny anymore. I expect soon some armed gunmen will arrive at AIG headquarters and open fire. Bonus are generally paid to people who have created a profit for their company. NOT when the company has been run into the ground and I am paying to keep it afloat. A bonus taker is a traitor. They should be put into jail. Although I did not write it personally, I quoted angry comments calling for armed action against AIG headquarters and included a Mapquest link to AIG's New York office (I did this to show the level of anger at the AIG bonuses). What exactly is the difference between these comments and Hal Turner's extreme tirade against judges? The simple fact is that when people get really angry, they sometimes say extreme things. 99.999 percent of the time, these comments are never acted upon and shouldn't be justification for throwing someone in jail without bail. Perhaps there is more to the Hal Turner story, but if there isn't, it is hard to see his arrest as justified. This entry was posted in Currency_Collapse, Market_Skepticism, News_Developments, Treasury, Wall_Street_Meltdown. Bookmark the permalink. Can anyone supply a link to the statement and/or those photos? Hal Turner is a nut who think it is great to kill people who do not agree with his world view. I would stay away from him, your credibility will suffer. Hal Turner is engaging in speech which if against the President and some other officials is an actionable crime. I remember a bright bulb writing a threatening email to the White House, from his home email address. But, no bail, maybe there is something to this? Just the idea that someone is trying to ditch 1/6 of a Trillion dollars is very scary, whether or not the paper is real. I thought all that stuff was done by Brinks. Let's be perfectly clear: I am not, in any way, defending Hal Turner's world view. I am suggesting that his arrest, based on the evidence released so far, seems strange and unwarrented (as far as I know, saying someone deserves to die isn't a crime). Or do you think it is ok to throw people in jail without bail because they don't agree with mainstream world views? Hal Turner is engaging in speech which if against the President and some other officials is an actionable crime. I remember a bright bulb writing a threatening email to the White House, from his home email address. Even if there isn't a direct threat? I am certain that, while Bush was president, I remember reading on blogs/message boards thousands of comments like "Bush deserves to die" or "Bush should go to hell." Were all of these comments (and there were a lot of them) actionable crimes? I am no legal expert, but there must be a difference Between 'They Should Die' (an incitement) and 'I'll Kill You' (a threat). I think Turner deserves it 100& because he published personal information along with the statement. He was inciting someone to kill these judges. Had he not published home addresses, I'd say leave him alone. But he crossed the line and clearly intended action, even if he was too much of a ***** to do it himself. The two "Japanese" ( actually both were Filipinos ) arrested in Italy recently reportedly with $134.5 billion worth of F.R.N. s, ( THE AMOUNT WAS IN FACT SOME FIVE HUNDRED BILLION IN CERTIFICATES ) were also carrying a series of documents signed by the likes of Alan Greenspan and Ben Bernanke with federal reserve logos and stamps embossed, signed and witnessed . The two were released after proving their credentials, and were released because they were carrying genuine diplomatic passports. The Pictures of the documents they carried are attached and we would like to hear some expert opinion on their contents (somebody is preventing us from uploading more than one picture). According to the official story put out to the corporate media, the Treasuries were forgeries (no doubt they will say the same about the documents pictured here) but if that is the case, why were the people carrying the �forgeries� immediately released, by extreme persons in high places in Italy, who had the power to silence Prime Minister Belosconi ? The truth is the Treasury certificates they carried were legitimate and are now in the safe hands of a new financial system. The instruments will be used to finance part of a Program at ending war, poverty and environmental destruction. It will also be used to develop previously forbidden technology. We may see some visible changes as early as next week as they carry out the new banking paradigms being incorporated, but, not with out resistance from the old abusive Wall street guard . Bernanke�s latest check has bounced but, as mentioned before, things will drag on to the September 30 secret fiscal year end then all hell will break out as the financial world, takes a ninety degree down-turn . The information above comes from very highly placed sources. If the sender of the confiscated bonds were a government, why didn't they use a diplomatic bag? Whether Hal Turner is a nut or not, is irrelevant. His case is important to all of us because it boils down to the first amendment rights. If you REALLY take a look at what he wrote, you will notice that it is protected free speech. There is a big difference between saying "judges deserve to be killed", and "kill them!". The family has a blog, where one can follow his case. To the previou Anonymous about Hal Turner, of course he utilizes his verbal statements constantly, but he is proving a point from time to time about politics, the economy, etc. These people, organizations, and companies that are publicly discussing or taken action are making an impact to create some form of questioning and action against these illegal means. By posting photos and addresses of the federal judges (as reported by CNN), Mr. Turner crossed the line. Authorities are on solid legal footing, and Mr. Turner's rage got the better of him. Whether or not he had inside information as to the authenticity of the bonds in question, no one knows for sure. This whole affair seems surreal, and the notion of trying to fence 139 billion dollars worth of phony bonds seems silly. How many stupid billionaires are there anyway? Japan, a country of 120 million, owns US Treasury paper with total value in excess of $700 billion. In order to escape the (rumored) coming Dollar devaluation, Japan decides to upload a substantial part ($134 billion or 20%) of that holding on Switzerland, a small country with a population as large as Manhattan (7 million). To execute this plan, they send two Filipinos with a Japanese passport to Italy. The treasury paper (worth $134 billion) is hidden in a regular suitcase which the two Japanese carry on board of a train traveling from Italy to Switzerland. At the border station, they are being searched by custom officers because their suitcase is not protected by diplomat status. This does not make any sense whatsoever. Ask yourself: How did the Japanese got hold of that US Treasury paper in the first place? Did they send two Japanese couriers to the US Treasury Dept which handed them over the paper, which they than hid in a suitcase aboard of a Japanese airliner on the way to Tokyo? No way. When Charles de Gaulle decided to exchange a few hundred million US Dollars into Gold in the 1960's, he send two French Navy destroyers to New York City in order to collect the gold. And the Japanese, in order to collect an amount one thousand times as large as the French forty years ago, send two tourists using a suitcase on a regular train? This is all total nonsense! Anonymous said: "At the border station, they are being searched by custom officers because their suitcase is not protected by diplomat status." There is one report about the couriers having diplomatic passports. There is no report about the persons being accredited diplomats! A diplomatic passport does not grant diplomatic immunity! To gain immunity you need to be accredited by your own government. That's an important difference. For luggage to gain immunity as a "diplomatic bag" it needs to be declared accordingly. For what it's worth, most serious students of the evilarchy view Turner as an obvious Fed.